trent is using Smore newsletters to spread the word online. He was born on Jan. 17 1942 in Louisville Kentucky. His parents were Cassius Clay Sr and Odessa Clay. He had one sibling, Rudolph Clay. He went to Central High School in Louisville Kentucky. He didn't go to college though. He started boxing when he was 12 and he has trained and fought other people for money. So he hasn't really worked other than getting money off of beating people up. He has gone to the Olympics for boxing. In 1984 he was diagnosed with Parkinson disease. What is Parkinson disease? It's when your body has a progressive movement disorder, meaning that symptoms continue and worsen over time. Usually in older or middle aged people. 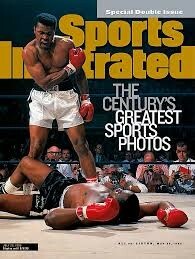 He won the Heavy weight Championship 3 times setting a record that still hasn't been beat. Also he has received the Medal of Freedom and was the last carrier of the Olympic torch in the 1996 Olympic games. He is 72 years old. Float like a butterfly sting like a bee. It's just a job grass grows, birds fly, waves pound the beach, I beat people up.